Summer is traditionally the time for rooftop pop-ups, but next week WigWamBam is re-opening as a heated rooftop bar on top of The Queen of Hoxton, on Curtain Road. It's last stint was between January and April; now it's back to serve drink and food in an atmospheric setting. "Shake off those winter blues because the Queen of Hoxton’s WigWamBam is back in town! Perched high above bustling Shoreditch on the edge of the city and swathed in fairy lights, the WigWamBam pop-up returns for its second winter. Possibly the cosiest tipi this side of Nebraska, the familiar setting brings back fond memories of camping with the Scouts/Brownies/Girl Guides (delete as applicable!) and will have everyone reminiscing about this summer’s festivals. Escape from the busy city and relax in a reclining chair by the crackling fire pit complete with (toast-your-own) marshmallows, S’mores (a winter essential, look ‘em up!) and a hot chocolate ‘spiked’ with a dark spirit of your choosing. 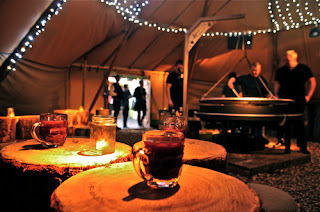 The Queen of Hoxton will truly be bringing the outdoors-in, with their famous, gigantic Schwenkgrill which hangs dramatically from the centre of the tipi cooking up delicious juicy leg of lamb lamb, loin of pork and mouth-watering haunches of venison. On weekend evenings, staples of wild boar sausages and venison burgers will be on the menu, to be washed down with hot buttered rum. Worry not veggies, as we’ll be feeding you too! Expect ceramic mugs filled to the brim with hearty veggie scotch broth and barbequed, stuffed butternut squash. Yum! 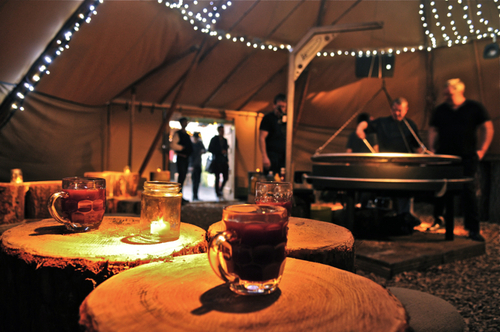 Whilst you sample the warming dark spirits on offer or even powwow in the corner with a steaming hot toddy, the Queen of Hoxton will be holding one-off events in the tipi to keep you thoroughly entertained. Keep your eyes peeled for the programme of events. If you didn’t get a chance to check out WigWamBam last year then hurry on down (or up! ), what are you waiting for?! And if you did, then you’ll know what all the fuss is about!"